Pinterest rolls out video ads in U.K. and U.S.
Pinterest is rolling out video ads in beta to test partners in the U.K. and the U.S. as it builds out its ad business to compete with Twitter, Facebook, and Google. Video ads appear as a user scrolls through Pinterest’s home or category feeds and will animate as the user scrolls back and forth. The in-feed video acts as a preview, and the user will have to click in or save the video to view it in full. Video ads can be up to five minutes in length and will autoplay once the user clicks in. The user can then repin the video to their own feed, or click the "visit" button beneath to go to a brand's website. A brand also gets six featured Pins beneath their video to show off featured products. The format allows brands to run video ads showing anything from recipe how-tos and beauty tutorials to straightforward ads or film trailers. It isn’t clear how much the new formats cost. 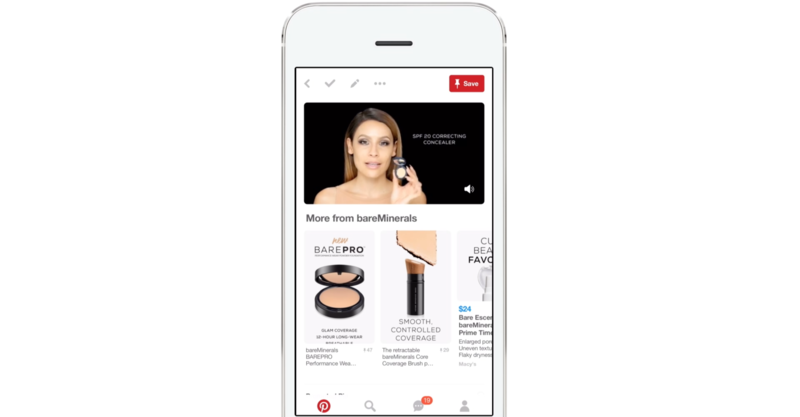 Pinterest has not announced test partners in the U.K., but is trialling the format with U.S. brands including Kate Spade New York, BareMinerals, Behr Paint, Purina, and Lionsgate. The company is hoping brands will combine video ads with other ad formats, including buyable pins in the U.S. that would allow consumers to buy products featured in the video ads. There are also Promoted Pins, which could highlight featured products, though there’s no ecommerce function. Promoted Pins are a static ad slot and rolled out in April in the U.K. Brands using Promoted Pins include John Lewis, Tesco, Topshop, and TUI/Thomson. Burberry has also extended its relationship with Pinterest to launch personalised make-up boards to push its Cat Lashes mascara. Pinterest is usually associated with static imagery rather than video but, according to the company’s own research, 67% of its users say videos "inspire" them to take action. In testing with "alpha" partners such as Old El Paso, Pinterest found video ads were four times as memorable as standard ads. According to eMarketer, video adspend will command a greater share of the digital ad market over the next year. The analyst house said video adspend on desktop could overtake search by 2020.